Here it is a week before Christmas and I still have Christmas cards and recipes to share. I guess I better make a real concerted effort to post a lot in the next week!! And what's wrong with sharing a few Christmas recipes in January to get a jump start on the coming year - right?? Geesh...... one of these days I will do a better job of juggling all of it. But for now, until the little elves come and give me a hand, I will do the best I can! 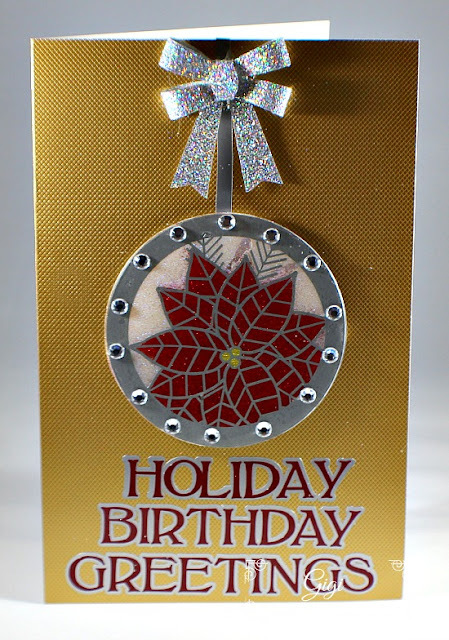 I needed to get a few birthday cards made, so I tried to combine birthday and holiday and am really pleased with the results. 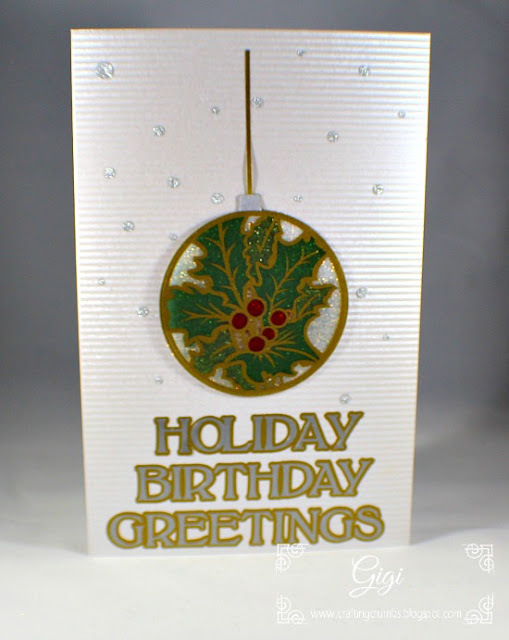 I made ornament embellishments for both cards using two entirely different files and designers, but kept the same greeting because it worked so well! This design is from Craft Vectors (Dominic). It is one of his Christmas Baubles collection. It was cut out of gold vinyl. 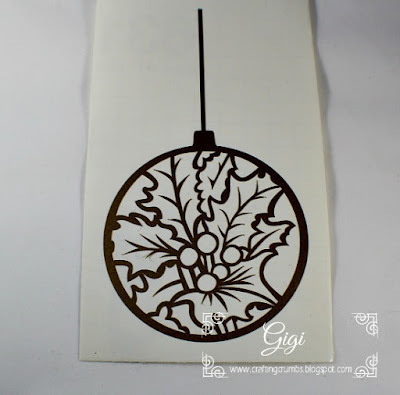 The designs were cut out of vinyl then transferred to adhesive backed acetate to mimic an ornament. 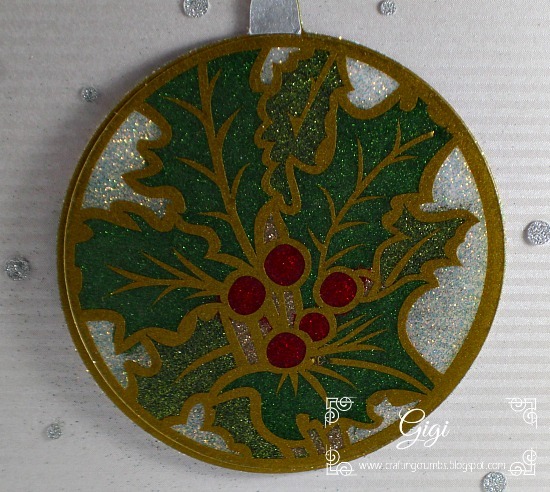 Then each was glittered from the back side. It's a bit tricky to stay in the lines (my perfectionist striving self struggled with glitter that went awry), but I still love how they came out! 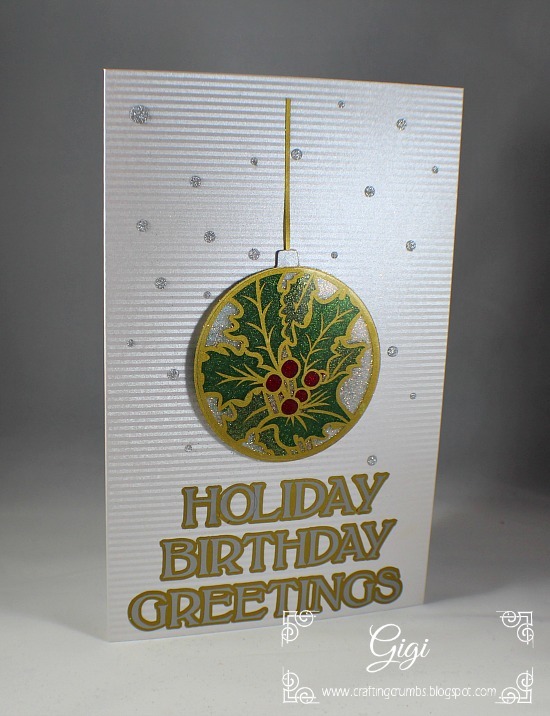 and it has been glittered from the back. vinyl and also glittered from behind once the acetate was adhered to the front. This is a relatively simple way to get a stunning look. This was the first card I did with simple sequins added to the card base. The sequins reminded me of falling snow. and added the glittered bow. 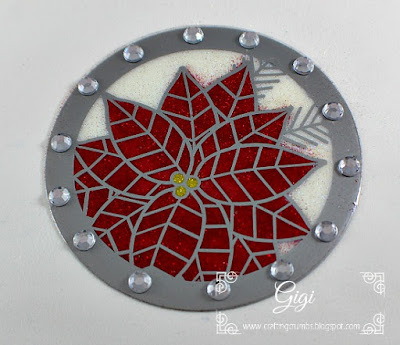 More projects and goodies to come.....stay tuned! 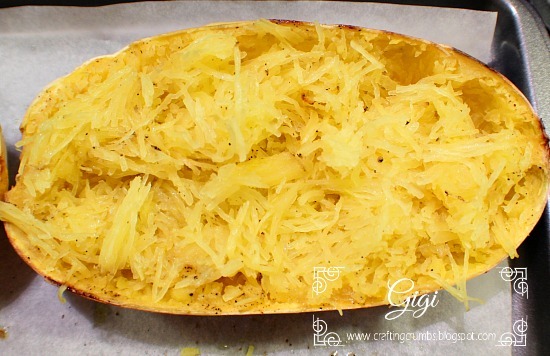 I love squash, but spaghetti squash is something I had never cooked before and had no desire to try. I am so glad I stumbled upon this recipe and it gave me the push I needed to venture out of my comfort zone!. This was so easy to roast and fun to shred into strands! And the bonus was that it was delicious too. 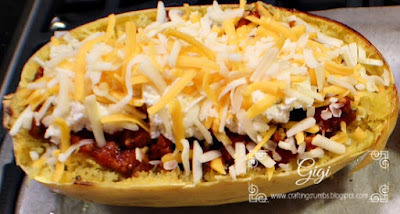 This is definitely something I will make again...and again!. Don't you love those strands of squash? Yes, food CAN be fun! While the squash is roasting (it takes about 40-45 minutes), prepare the sauce. Heat the olive oil in a skillet over medium heat. Sauté the garlic until fragrant, about 1-2 minutes. Add the marinara sauce, tomato paste, chopped chicken meatballs,* crushed bouillon cube or beef base, sugar, 1 T. of the parsley and the remaining herbs.**. Season with salt and pepper to taste. Reduce heat, cover with lid and simmer for 20-30 minutes to let the flavors meld. 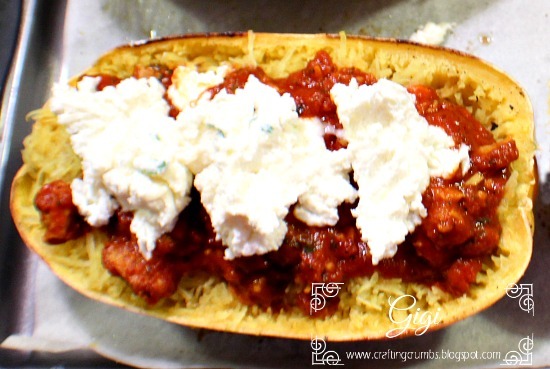 While the sauce is cooking, mix the ricotta cheese and parmesan cheese and set aside. 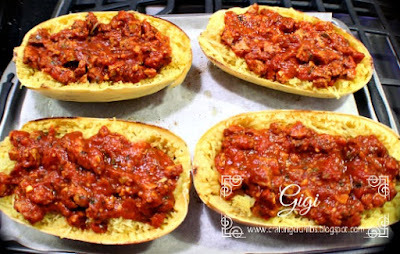 Each squash half is enrobed with about 2 cups of meat sauce. And then the cheese....use mozzarella, an Italian blend, or whatever you have on hand. * You can use 1 lb. ground beef or turkey - just add immediately after the garlic is sautéed and cook until no longer pink. Follow the remaining steps. 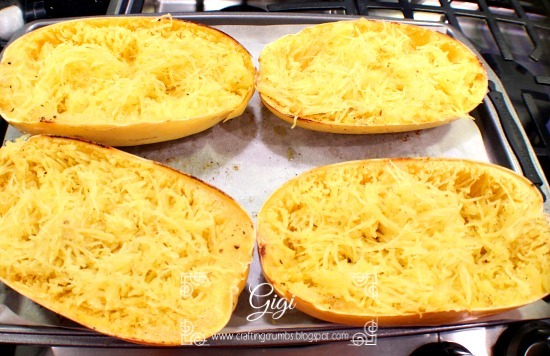 Place the squash halves in the center of the oven and broil for about 10 minutes - until the cheese is melted and browned. Top with remaining fresh parsley and serve. 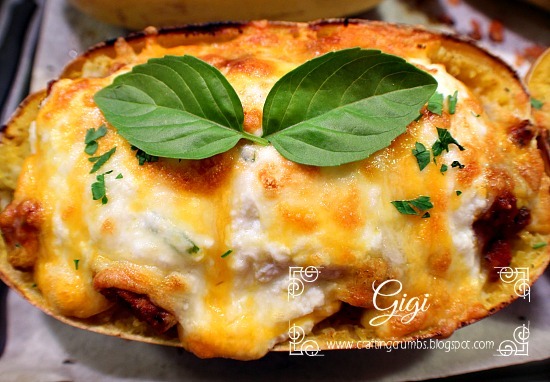 You will be surprised at how delicious and filling this is - and you will want to make it again soon! I promise! And the bonus is that it's relatively healthy too!